The murky legacy of Henry Ford—who would’ve been 150 today—centers around a few familiar ideas like the assembly line and the $5 workday. 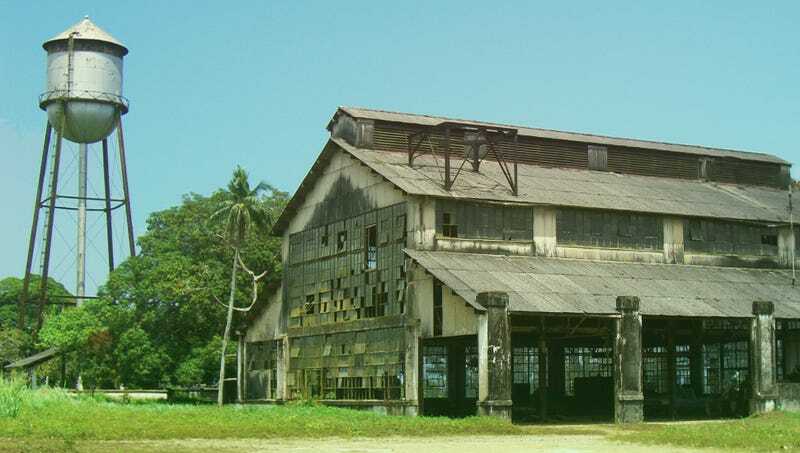 Less familiar is Ford’s biggest failure: Fordlandia, a city in the rainforest that was abandoned as quickly as it was built. Ford was a farm boy who went on to establish 20th century consumerism as we know it, but he had plenty of missteps, too, ranging from his virulent anti-semitism to his attempts to engineer whole communities around his ideas about labor practices—including the one he built on the edge of the Brazilian rainforest. So, whence Fordlandia? The community was spurred by a problem caused by the incredible success of Ford’s empire. By the early 1900s, America was gobbling up more than 70 percent of the world’s rubber, most of it going to Detroit. These were the days when rubber still came from plants—meaning that most of it had to be shipped from Southeast Asia. Ford, a dude who was pretty into efficiency, was hesitant to keep buying his company’s supply from Asia, where British rubber plantations were churning out most of the global supply. So he set out to establish his own rubber farm. In a fit of creativity, he named it Fordlandia. In 1928, Ford sent an envoy of supplies and Ford workers to a 6,000-square-mile plot of land on the Amazon. The charter's mission was to embed American suburbia in the heart of the rainforest. Within a relatively short period of time, they’d set up homes, running water, electricity—plus all kinds of other extras (like swimming pools) that played to Ford’s belief that leisure was an essential part of the economy. A workman’s mess hall was set up, but native workers did not like the wholesome Detroit style cooking and complained bitterly of indigestion. North American fare in the jungle no more pleases the customers than a quick change to Amazon fare would please you or me. This kind of blatant cultural whitewashing might’ve flown, had the rubber production itself taken off. But it turned out that rubber plants were being cultivated in Southeast Asia instead for a very good reason: There were no natural floral predators there, as there were in Brazil. Production was sluggish, and the Michigan managers had zero botany know-how. What’s more, native workers began to rebel (surprise!) against the strict rules about lifestyle. Soon, a so-called “Island of Innocence” was established in the middle of the Rio Tapajós, where workers could go to kick back with a drink and a female companion. Riots broke out a few years later. In 1933, Ford hired a professional to find out why his plants weren’t growing (poor soil quality). He tried again and again, relocating Fordlandia to a better patch of land downstream. The town was still underperforming. Fordlandia's final death knell rang a few years later, when the invention of synthetic rubber made the town irrelevant. Soon, Ford had sold the land back to Brazil at a loss of around $20 million (or $200 million today), leaving Fordlandia's little suburbia to decay. Today, the town is a decaying collection of ruined buildings. There is in fact an uncanny resemblance between Fordlandia's rusting water tower, broken-glasses sawmill, and empty power plant, and the husks of the same structures in Iron Mountain, a depressed industrial city in Michigan's Upper Peninsula that also used to be a Ford town. They didn't fail for the same reasons—but in a way, Ford's ideas about consumer spending contributed to the decay of both. Check out Grandin's excellent history for more, if you're interested. Images via Sometimes Interesting. Lead image by Amit Evron.